After a year when the words "wall", "falling" and "crumbling" were never far from the headlines, Rahul Dravid could have been forgiven for thinking he had become Humpty Dumpty, instead of the most prolific No.3 batsman the world has ever seen. It really had been a wretched 2008, with 669 runs from 14 Tests before he arrived in Mohali. This, remember, was the man who made more than 600 runs in series in Australia and England when he was in his prime. There were no clenched fists or frenzied waves of the bat when he reached his century on Saturday, but the man who sat behind the microphones later in the day looked like someone who had finally seen the light after weeks of confinement in an underground cave. "There was no statement," he said when asked about the muted celebrations for his 26th century. "I was just happy. I'm older and wiser now. I don't jump around and get excited. "I'm relieved. It's nice to be contributing again. It's been a tough year, and it's good to make an important contribution, especially with the conditions that we've had in this game." The partnership with Gautam Gambhir was worth 314 runs in 107.5 overs, its significance evident when the next highest stand was 40 runs. "Hopefully, it will be a match-winning partnership," Dravid said. "Gautam batted beautifully and took the pressure off me. He rotated the strike and was positive against both the pace bowlers and spinners. He's having a phenomenal year." England fought back spiritedly after breaking that partnership, but they should also be worried at how subsequent batsmen failed to make much headway on a pitch that's sure to play a few tricks over the next three days. "At 300 for 1, we were looking around, wondering where we were going to get a wicket from," said Graeme Swann, who along with the indefatigable Andrew Flintoff was the pick of the bowlers. "The way Dravid played, he hardly gave us any chance. He was exceptional." Dravid himself couldn't really pinpoint a reason for the turnaround. "This year, I've tried everything," he said with a laugh, when asked if he'd gone back to videos or books to get out of the slump. "I watched a few old videos of me batting well to recreate some of those emotions and feelings. "But the last two series, I've just enjoyed each net session, trusted my instincts and watched the ball. "The way I judge if I'm batting well is by how I bat in the nets. Against Australia and even in this series, I felt like I was batting well, but there weren't the runs to show for it." He batted beautifully on day two, clipping the ball off the pads with his old fluency and also easing it through the off-side gaps when chances presented themselves. After taking 205 balls for 65 on the opening day, the next 71 runs took just 123 deliveries. "You grow comfortable, the more time you spend in the middle," he said. "Your feet move better. You pick up the length better. They bowled a good testing spell with the new ball and we were lucky to get through." He called it one of his "most significant innings", and admitted it might not have been possible without the reservoir of goodwill from fans and experts alike. "There's been lots of scrutiny and speculation because I haven't played very well," he said. "I haven't got enough runs. It's been tough personally. "So many people have been wishing me to do well. It's at times like these that you realise how many want you to do well. They didn't need to be, but they were so supportive - former players, and even those in the media. That's all you can ask for." What Mahendra Singh Dhoni will ask for from here is a repeat of the bowling excellence that humiliated Australia here two months ago. "They tested us right through," said Dravid of the English bowling. "But we'll aim to pitch the ball further up and get more swing, make them drive a bit more." If the skies overhead continue to be overcast, that could well do the trick. As for Dravid, the overwhelming sense of grey has given way to a patch of blue sky. For some, like his three-year-old son Samit, though, life's about far more than centuries and revivals. "He just wants me to come back home." A match-winning century to go with so many others wouldn't be a bad thing to take back. 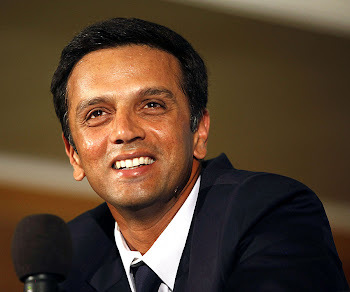 Go Dravid.................................I told you before he'd be back. i had the privelege of watching him score his previous century in Chennai against RSA when he crossed 10,000.